If you hadn’t guessed, the world in Monster Hunter: World is pretty important. 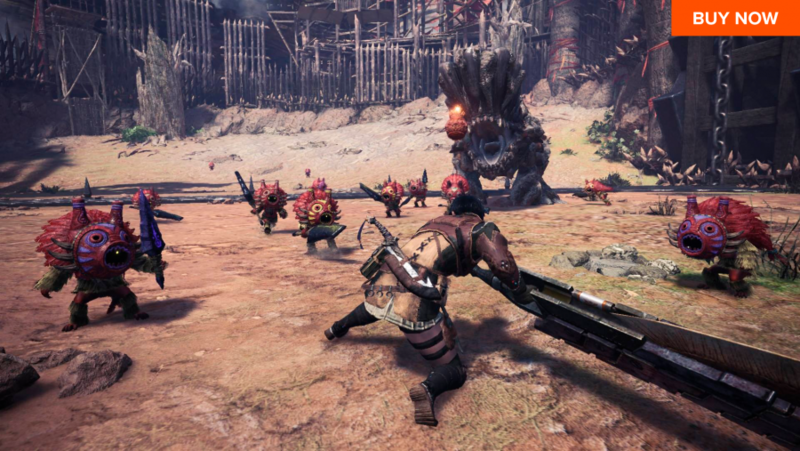 While the title points to the fact that this is the first Monster Hunter game with proper open environments, it also indicates that the setting is as vital to the experience as the monsters you’ll be taking down. You’ll be heading into a thriving ecosystem populated by creatures big and small, as well as a range of flora, all of it richly imagined and essential to enhancing your hunter’s ability to survive. Set at the dawn of discovery of the New World, Monster Hunter: World sees the Research Commission task hunters with taming the wilderness so that the population of the Old World can settle. Taming these forests, valleys, and wastes naturally involves hunting monsters, because there’s no way people can live harmoniously in a world full of stampeding Barroths and Nergigantes now, is there? If the idea of exploring this extraordinary world is your idea of a perfect vacation, then let us be your travel agent. Let’s take a look at some of the New World’s key delights, what experiences the trip can provide, and why you should consider making it your destination when Monster Hunter: World releases on Steam on August 9. While the New World is full of dangers, there is a safe space to call home: Astera. This village, made up of an upturned airship and several layers of wooden decking, is Monster Hunter: World’s hubzone, and the place to do all your preparation. Here, you can get the Smithy to fire up his forge and craft you new weapons and armour, practice your fight skills in the arena, check in with the Research Commission to pick up new bounties and quests, or hang out with friends on the top deck for drinks as you plan your expeditions. And, if you’re feeling hungry, you can get a freshly prepared, stat-boosting meal from the Palico chefs at the Astera Canteen. Yup, they are Michelin-star-trained cats. Venture beyond the safety of Astera’s walls and you’ll find yourself in the depths of the untamed New World. It’s a dangerous place, sure, but it’s also a beautiful continent overflowing with sights to discover. You’ll first explore the Ancient Forest – a lush green zone with deep cave networks, twisted trees, and sunkissed clearings. Hanging from the branches and hidden among the bark you will find honey, mushrooms, and other useful natural materials that you can use to brew stat-boosting or health-restoring potions. But it’s on the floor that you’ll find the zone’s most interesting tidbits: footprints. In Monster Hunter: World, you’ll need to track your prey by paying close attention to the landscape. Footprints in the dirt, saliva smeared across a wall; they’re all telltale signs that a monster came stomping through. Your scout flies – a jar full of vibrant green bugs – will help spot these clues should your spying skill not be up to scratch. With a trail established you will then need to follow it. While you may be fast on your feet, it’s more fun to make the most of the world’s little shortcuts. Scrabble through tight spots, run along branches, and swing from vines to open up shortcuts that make getting from A to B much more daring and exciting. After exploring the Ancient Forest and dealing with the giant jaws of the Great Jagras and Anjanath, you can then work your way through the other Monster Hunter: World environments. Each of the zones you’ll visit are unique biomes, offering entirely different landscapes, challenges, and creatures. First you’ll visit the rocky Wildspire Waste, with its sticky swamps filled with aquatic beasts, and tall cliffs perfect for dragons to perch upon. Then it’s off to the Coral Highlands, with its beautiful pastel colours, tall and alien-like plantlife, and exotic monster designs. There’s plenty more to see beyond these places, but we wouldn’t want to spoil the surprises. 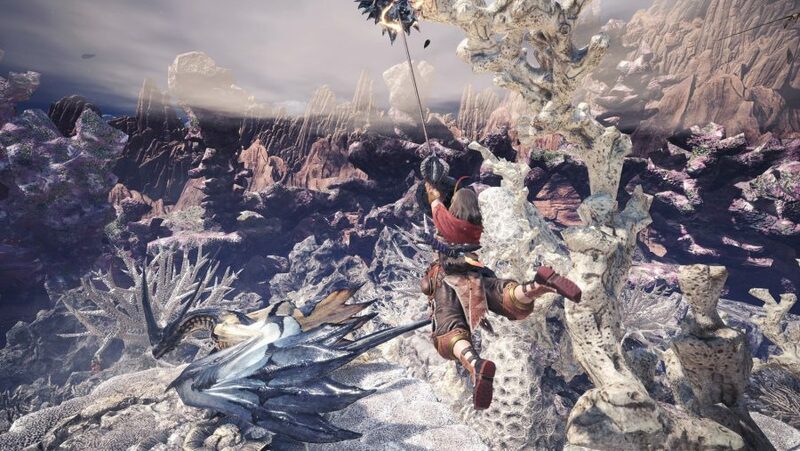 Just know that each zone not only looks different but has its own thriving ecosystem and unique monsters to hunt. The New World isn’t limited to one style of terrain or wildlife; there are five unique maps to visit, plus other special zones for key story set-pieces. So what are you waiting for? 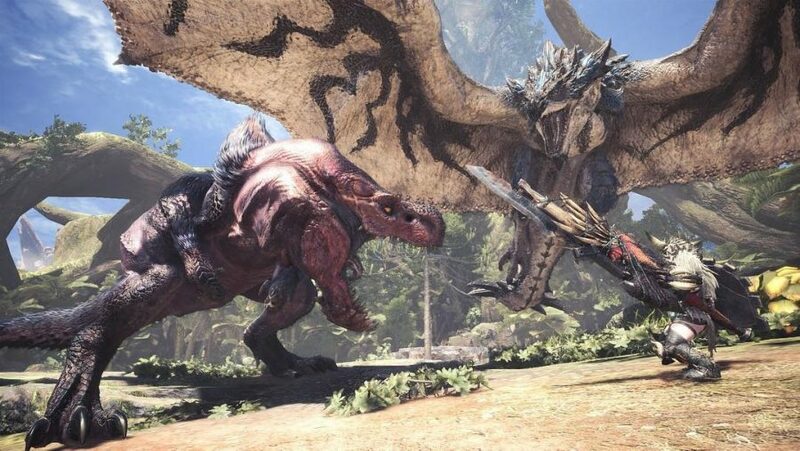 Monster Hunter: World is available now on PS4 and Xbox One now, and will be soon on Steam on 9th August, so you can spend your summer in the beautiful and exciting lands that make up the New World. It’s an expedition you won’t forget in a hurry.